This last week I was involved in a few conversations that surrounded businesses that are on social media, more specifically those that either are executing it well and those that are just there. It got me thinking about the millions of brands, both large and small that have a social presence, yet clearly do not have a corporate culture of social within their organization. As I pondered this, I also thought about our organization that not only lives in social, but was born out of a social media agency and used this as our guide. Since many large brands are now in social media and easily garner large audiences due to their prolific branding and massive advertising budgets over many decades, it is important to point out that MOST have anything but a corporate social culture. In fact many of the larger brands we all know around the world have some of the worst social media marketing execution. I am not talking about just the epic fails we read about from these massive corporations, but even their daily social media activities are a slap in the face toward what any experienced social media professional knows about this space. For this and many other reasons, I personally avoid large brands online. I stay clear of their noise, self-promotion and other social marketing efforts. If I based my shopping on their lacklustre social media marketing and poor engagement, I would never be able to bring myself to visit many stores. But I digress. Rather than detail all the failings of brands within social media, we decided it might be far more helpful for many small and medium brands to develop a list of traits that are displayed by brands that have created and fostered a corporate culture of social within their business. We got feedback from our awesome community as well and are including their thoughts on some of the traits. 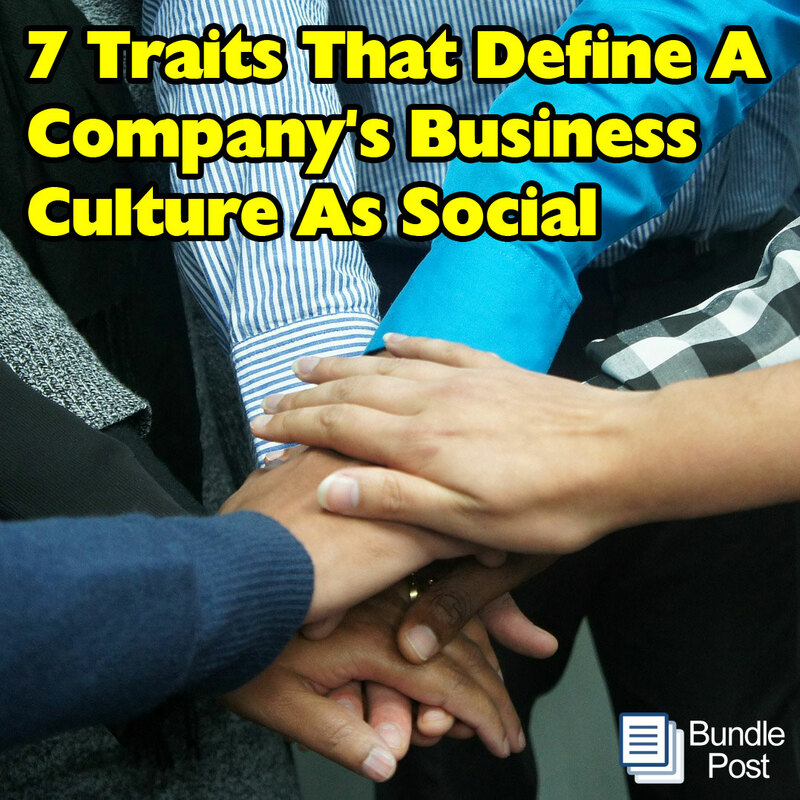 Though this is not an exhaustive list, we believe it embodies the large bucket items that define what a social business is. 1) Priority Top Down – Bar far, the most important trait that establishes social into a business culture is top down leadership. When the executive team at the top make a clear commitment to social media, done properly, it becomes clear to everyone inside as well as outside that organization. Without embracing social as a corporate priority, social media departments are clearly handcuffed and it shows. Empowering teams around social from the very top of your business not only unleashes the other traits in this post to be free to execute, it mandates the traits into every member of the company. Tangent – Just last week on a call with our CTO (Chief Technology Officer) going over our development priorities, we were discussing something an existing Bundle Post user brought up that they really needed. Our CTO said “Well that is a current customer that has a strong need, so I think that should be a priority.” Adjustments were made to the priority list accordingly because our entire leadership has a social focus. When the leaders of an organization have a commitment to and then drive a social culture, nothing but good will result. 2) Consistent Communication – A social business culture isn’t just ON social media, they continually communicate internally their social priorities, what those priorities mean and how they are expected to be executed. 3) Transparency – A social business doesn’t hide their mistakes internally or externally, instead they admit to them quickly and take steps to correct them. They don’t pretend to be perfect and portray a sense of reality of their business that is human and approachable. 4) Responsiveness – It’s true that people want to know they are being heard, but even more importantly, they want a response. Social media is social AND media combined. When a brand has a presence but doesn’t respond to the good, bad or otherwise, people feel that they are not heard. Even worse they are made to feel they and their issues don’t matter to the brand. When a brand is responsive to their customers and prospects on social media, and do it in a timely manner, the opposite impression is made. Brands that truly understand this and have a social culture in their organization build life long customers. 5) Sincerity / Authenticity – It’s one thing to go through the motions, it’s another thing to actually care. When a company has fostered a culture of social in their organization, every team member has sincerity and authenticity in what they do. Customers are never left wondering if the brand cares. It shows through the way the brand conducts their social media efforts. 6) Empathy – Social businesses teach empathy within their organization. It is a priority that all levels of the organization understand the plight of their customers before and after the sale. This means that the business educates its teams on the pain points their customers have, how their products and services ease those pains, but most importantly the importance of the customer later in the relationship. Not just the ongoing revenue opportunities down the road, but the utter importance of handling that customer properly when they have a problem. 7) Customer Priority – The social business doesn’t necessarily believe that customer is always right, but the customer is definitely a priority in the business culture and it shows. What we find so interesting about these traits is that they are the same traits that any successful business should deploy. What I mean by that is, if the social media element was removed, the leadership, customer centric empathy within all of these traits are what great businesses have been doing for decades. Instill them in your social business culture as well and the effectiveness of your social media marketing efforts will breed loyalty, revenue and sales growth beyond your expectations! Great post, Robert – Some awesome points and prudent reminders! Honored to include your input on the topic Keri! Great article Robert! Right on point. Thank you for the mention. I’ll gladly share this around my communities. Thank you for contributing Rebecca! Great post again! A company’s culture must be felt, not spoken. So True Erika! And if your brand is going to be really successful in social, actions matter. After dealing with United this week, I would have added this tweet: “Helpful” #SocialMedia pros deadheading issues offline isn’t customer service—it’s customer silence.